Well its been a while since I've updated my blog and I feel a bit like a neglectful mother so in the next couple fo hours/days you are gonna be seeing a whole lotta lovin' and action! I have heaps of recipes to post so hopefully I can get most up here pretty quickly! This first one is from about a month ago. My greatest friend and I treated ourselves out to lunch on a beautiful autumn day. We found a great little cafe with lots of fresh and seasonal produce and, being the responsible and healthy people we are, we each chose a delicious salad. We were so impressed with what came out that I had to steal the recipe just for you guys! 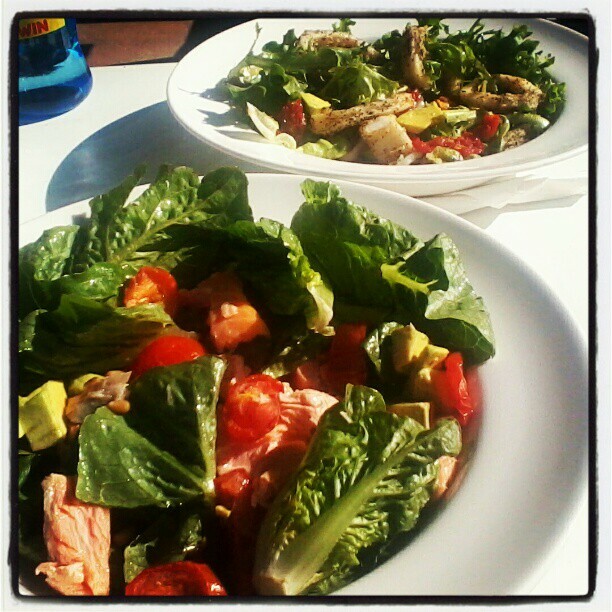 So here we have two fantastic, delicious, restaurant quality salads for you to indulge in. Enjoy! Manuka Smoked Salmon, Cherry Tomato, Avocado and Pinenut Salad. Both salads are impressive, although the Squid salad is a little more work. Let me know if you get a chance to make either, I'd love to hear how they went!